Sub- Division/ Railway -wise status of pending pension eases of Normal retirement and Other than normal retirement. Hon’ble Minister for Railways has expressed concern that there has been inordinate delay in finalization of pension cases on all units of Indian Railways/Production units. It is desired that immediate Steps be taken to streamline the system in place. 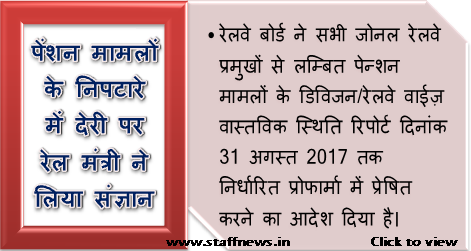 A division/Railway-wise status report on pending pension cases of Normal retirement and Other than normal retirement as on 31.3.2017 has been sought. It is therefore requested the requisite details may be provided in the following format by mail at jda[at]rb.railnet.gov.in by 31.08.2017. Hon’ble Minister for Railways has expressed concern that there has been inordinate delay in finalization of pension cases on all units of Indian Railways/Production units.Railway Board seeks requested the requisite details for status of pending pension cases.